It is well-made and versatile. It works with any sized container, bottle, or can. It’s easy to place where it won’t cause any issue with interfering with the operation of your wheelchair. It’s lightweight at only 2.7 ounces. It is sturdy and easy to install for use right away. The BodyHealt Universal Cup Holder can accommodate several sizes of cups and bottles. It’s adjustable so you can attach it to anything that has enough space to hold it. It’s made of heavy duty plastic so it will last. This product is designed well with careful attention to detail. It is an excellent value for a bag that is convenient to use. The Wheelchair Bag by Vive is more of a shoulder bag than a backpack. It is roomy with plenty of space for holding things. It’s easy to slip over the back of a wheelchair with its adjustable straps. It’s made of nylon which is durable yet lightweight. 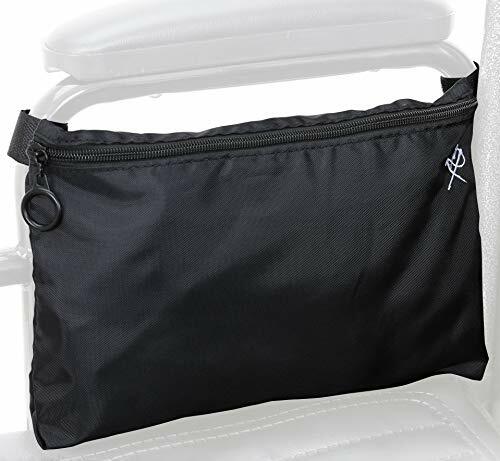 It has two large pockets for keeping your things separate. The Pembrook Wheelchair Pouch Bag is a handy item for keeping your things close at hand. Like similar products, it has Velcro straps for attaching it to your armrest. 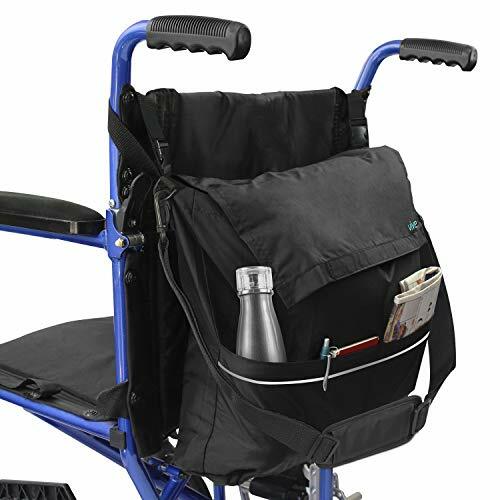 You’ll get the best use out of it if you hang it on the inside instead of the outside of your wheelchair where it might get in the way. It has three outside pockets for the things you need access to most often. The Diestco Soft Tiller Basket has several features worth noting. It has a mesh outer pocket and smaller enclosed one on top for putting keys or other small items. The construction is solid with a lot of care taken in the design to make it convenient to use. It also has a price-matching guarantee. Its large size and excellent design make it worth a look. The Diestco Monster Bag has a fitting name. It is roomy and fits on the back of a wheelchair. The straps for attaching it are well-constructed. This one will stay in place. Like the previous product, it has a top zippered enclosure for quick access. It has two large outer pockets located on both sides with a smaller top one on the front of it. It’s made of polyester for durability and strength. All will affect the value of your purchase. We’ll discuss each one in detail with information about how they can affect your choice. 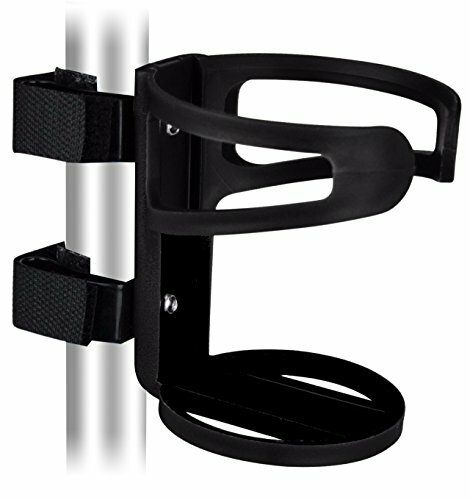 You’ll likely find plentyof wheelchair pouches and holders for just about any use. Some are must-haves whereas others fall into the nice-to-have or even over-the-top categories. That’s why it’s essential to begin with considering what you want out of these products and what features are necessary. You have limited space, and too many things could hamper your ease of getting around. Bear in mind that marketers will call some items by different names to sell their products for so-called niche uses. That’s why you need to read the product descriptions carefully to make sure you’re getting what you need. Think about how you would use these products. If it sits on a dresser and doesn’t get used, it wasn’t a practical purchase. Consider what would make your life easier. If you like to go shopping when you’re out, a backpack is a handy thing to have to take things home. We prefer products that keep items separate for easy access. Outside pockets are a good for items like sunglasses or your smartphone. If you enjoy going out on the trails in your local park, you’ll welcome a cup holder to keep you hydrated on your jaunts. Likewise, give some thought to how simple it is to use if you’re going to take it on and off frequently. Most have universal attachments so they’ll fit on the majority of wheelchairs. Also, consider how securely it holds things. For a product to be useful, it must be functional. If you’re going on public transportation, for example, you’ll want a bag that you can close securely. Take time to look at its features such as the clasp, straps, and zippers. Note the number, size, and placement of pockets too. We prefer zippers over snaps merely because they are less likely to open. It is frustrating to buy a new item like a bag or purse only to find that the material inside is flimsy and likely will tear with regular use. Look at the overall construction of a product, paying attention to spots where it may rub against your wheelchair and get damaged. Some bags attach to the back where they can cause problems if they’re too long or too wide. We recommend checking out the measurements and seeing how they compare with your wheelchair. Adjustable straps are essential to make sure they stay in place no matter how much you’re putting into your bag. Check out how accessible it is too and where the closures are located. The price range of these types of products is all across the board. That’s why it’s essential to consider the construction of a pouch or bag so that you can get the most value out of it. It does little good if it looks attractive but is poorly made. You’ll likely see synthetic fabrics like nylon or polyester instead of natural ones. The former are excellent choices since they are often tear-resistant too. We prefer bags that are waterproof or at least water-resistant. Accidents happen, and it’s a smart way to make sure that everything inside stays safe and dry. If the price is a concern, look for products that can serve multiple functions. A large bag can suffice for carrying your groceries home as easily as it can as a place to hold your tablet or books. Some may include other convenient add-ons such as a cup holder too. We’d also suggest looking at the features of any item that you are considering buying. Of course, they come at a price. Don’t pay extra for things you don’t need. You may find a comparable product that serves your needs at a better price without all the bells and whistles. Do yourself a favor and check out what each one offers before finalizing your decision. You’ll find that some products come with a satisfaction guarantee or warranty on the construction. If it is a bigger purchase, we urge you to stick with items that offer these perks for your peace of mind. 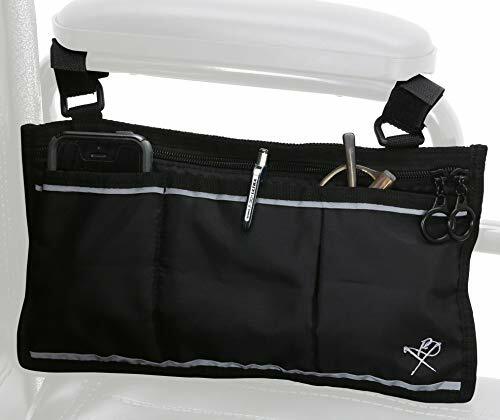 The best wheelchair pouches and holders make your life easier by making toting things with you less cumbersome and more convenient. The ideal choices toe the line between convenience and cost. In the end, the decision becomes about which features are worth the extra money to get the greatest value out of your investment.